If you are looking for a party bus limousine rental and limo bus in Toronto, look to Platinum Party Bus Limo bus rental services, where party bus limos are what we are all about. From party bus limos that seat 18 passengers to 26 passengers, we have a limo bus with your reservation waiting. Planning a wedding in Toronto? Look to Platinum Party Bus Limos today to book a wedding limousine. A party bus limo is a great option for a wedding especially if you have a larger wedding party with immediate family that you want to transport from the ceremony to the reception. Along with party bus limos, we also have larger, more luxurious limo buses that can seat from 30 passengers to 50 passengers. We have customer service reps that are available to answer your questions on booking a party bus in Toronto. We advise that you plan a booking ahead of time, especially a wedding limo and a prom limousine. 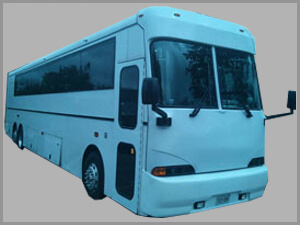 As we have a large selection of party bus fleet that you can choose from, we are always booking and accepting advances booking for special occasion, so contact us today and rent the limousine bus that is right for you. You will be satisfied from the quality of the limo bus all the way down to the limousine driver for your party bus limo rental today.